The mediaeval village of Najac is classified as one of France's most beautiful villages. And, it's not hard to see how it earned this accolade. Sitting atop a rocky ridge, gazing down onto dense green forests and boasting authentic timber framed houses and a picturesque chateau, Najac is simply stunning. The village lies in the department of the Aveyron, easily accessed from Rodez airport. The village is only small, but its long association with tourism means that it is surprisingly well equipped. There's a good range of small shops at your disposal, and several cafés and restaurants to enjoy as well. Sunday morning sees the arrival of a colourful little market, adding even more French authenticity, were it needed! This is where Najac excels. Utterly exquisite, its half-timbered houses are truly mediaeval and create a delightful atmosphere. Essentially consisting of one long, curving main street, Najac's charms are further set off by the chateau. Once stunning, the castle of Najac is now partially in ruins, but it's still an imposing sight. The 13th century church is worth a look too. The culture of Najac is also worth a mention here as it plays a good part in the village's enduring appeal. A whole host of cultural events take place here throughout the year, so whether you like the sound of attending a jazz festival, browsing the stalls of a flea market, celebrating local food and drink or looking for literary treasures in a book fair, Najac will welcome you to join the fun. Najac is inarguably beautiful, but it is only a village and there will be times when you need to go further afield. If you need access to supermarkets and a greater choice of shops, you only have to travel to Villefranche de Rouergue, where you can find plenty of places to do the weekly shop. Of course, the larger towns of Albi and Gaillac are also accessible with everything you could want on offer. They are also of historical note, so worth exploring if it's heritage that catches your interest in this area. Gaillac too, is noted for its wines. If the charms of Najac have whetted your appetite for more beautiful villages, take a look at Belcastel. It's another "Plus Beau Village de France", and sure to capture your heart with its cobbled streets and the beautiful castle from which it takes its name. When you've had your fill of history and culture (not to mention delicious food and wine) you might be looking for some activities to try. The good news is that there is a lot of choice near to Najac. The village lies on the River Aveyron, and there are opportunities to try kayaking from the nearby Activity Centre. Here you'll also find a climbing wall and mountain bike hire. Getting away from Najac but still within easy reach, you might enjoy pony trekking, walking or even paintball! Rodez is the nearest airport. Toulouse, a little further away but still perfectly accessible, offers a much larger choice of flights. Train travel on the super-fast TGV will take you to Toulouse, Cahors or Montauban. Finally, if driving, you'll find Najac between the A20 and N88 motorways, on the D39. The D922 is the closest major road. Najac, as one of the most beautiful villages in France, is a popular destination for holidaymakers and property seekers alike. So, you'd expect to find high prices and little availability. But, just a glance at what's on the market right now in Najac will amaze you. A lovely, bijou village house for only 45,000 Euros? Don't mind if I do! Then there are larger properties still priced at far less than you'd expect, with opportunities to buy a renovation project or a unique character property for less than 100,000 Euros. Knowing Najac's popularity, these properties won't be on the market for long, so what are you waiting for? Do you know Najac better than we do? Do you have photos of Najac? Najac lies in the central south of France, in the west of the Aveyron department. Access: By air: Fly to Rodez or Toulouse. By rail: Travel by TGV to Toulouse, Cahors or Montauban. By road: The town lies between the A20 and N88 motorways, on the D39. Economy: The economy is mainly reliant on tourism and agriculture. 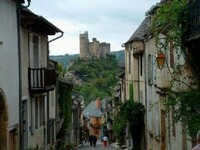 Interesting fact: Najac is officially recognised as one of the most beautiful villages in France.